A blog following a British couple on their gaming adventures in World of Warcraft and beyond! I don’t know about you guys, but my LFG experiences haven’t always been the most enjoyable. Let’s start at the beginning: running Deadmines as a new player with no idea what I’m doing… the experiences aren’t that great to recollect. Lots of snide comments, getting lost (I know it’s “just a path to follow”, but that’s quite daunting for a new player!!!) and rolling on the wrong loot. You would think people would be kinder to someone who is obviously a new player. I always take sympathy on those poor tanks or healers in LFG who clearly try their hardest but fail spectacularly. Like the Tank wearing int gear, or healers in DPS spec. I’m pretty sure we have all been there at some point. It’s like the Learner Driver situation: you’re stuck behind them doing 20MPH in a 40 and you’re late. We have all been there, we should be more understanding. However, as you go up through the levels I think generally it all gets better. Especially these days with all the heirlooms, you rarely see a player who is slumming it with questing gear which makes levelling through dungeons a lot easier. I tried tanking many moons ago, and although I was terrified, I was so invincible in heirlooms that my skill – or lack thereof – didn’t see to matter. Isn’t this a shame? 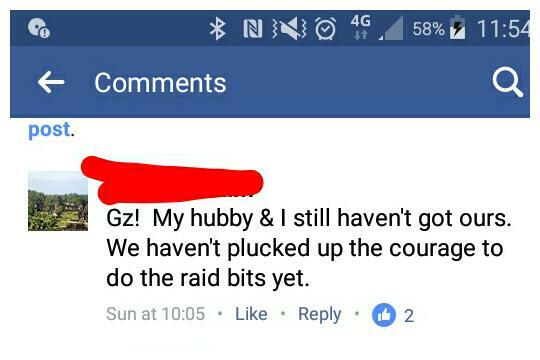 People are scared about grouping in a MMORPG because of the few idiots that make the game unenjoyable in raids. I think that’s really sad. 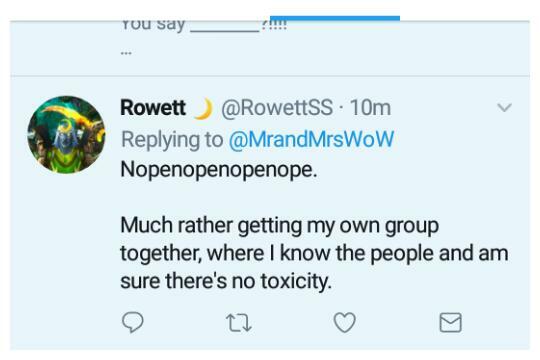 So often, you see people who “only do solo content” for this reason. Why can’t we all be more tolerant? 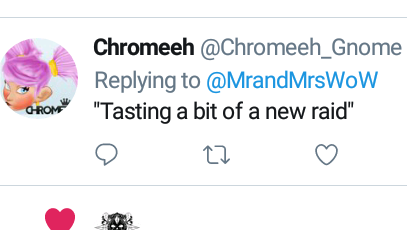 Just for fun, I asked twitter what they thought. I think lots of people would agree with Rowett. 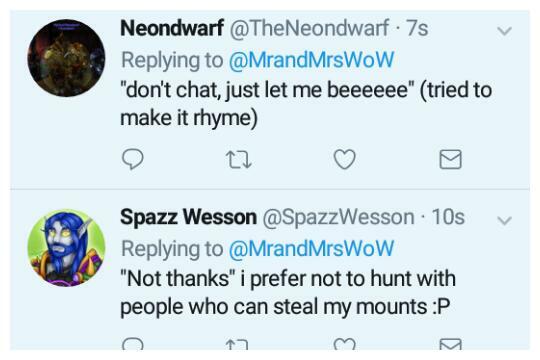 The variety of responses is interesting, don’t you think? I guess most people only enter if they have to, which with Legion’s current profession quests is kind of a necessity if you want those professions maxed. This situation harks back to those PvP quests where you have to go kill x and grab y amount of z to complete the achievement for the mini holiday. All those PvPers getting irate with the casuals coming in without the right gear just for XYZ. I can see how it makes people resent it, and although I can see ee why it’s there, it’s not something I think is inherently needed. Anyway, I could write on and on about this subject. I love the LFG feature and I think it has its place.I love MMO’s too, but just like real life, dealing with some people is more difficult than others. 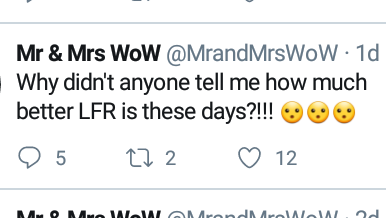 I think we all need to be more patient with each other and LFG becomes manageable! What do you have in your bags? We suggested this topic because it is THE BIGGEST argument we have in game. It’s ridiculous really, because he’s the one with the issue and IT DOESN’T EVEN AFFECT HIM. I can’t stand her bags. There’s no organisation. There’s too much in them. They’re messy. You can’t find stuff. She doesn’t have bags dedicated to certain things. It absolutely does my HEAD in. Here are mine, this is what they should look like. I love an organised bag. I would usually use BagOn or similar, but our current PC can’t run addons so I’m going at it alone. As you can see, consumables, junk, mats, gear… all have their place. Whereas look at this abomination…. Backpack is – as it suggests – stuff I use regularly. I hate that this is only 16 slots… why haven’t they updated this?! I keep Hearthstones, useful trinkets, health potions, bandages and usually fishing gear as I swap in and out of that a lot. The big hexweave bag on the left is always profession stuff. Fish, mats, cloth, other crafting reagents. This isn’t usually enough space though, so it tends to overflow into the royal satchel above the backpack. I usually keep the class hall armour set things for the followers here too. The top most bag is always pet battles, food and fishing extras. The other bag is for everything else. Perfectly organised and if you changed things around I wouldn’t have a clue. Her bags give me hives. Just for giggles, I’ll show you her bank bags. You ready for this nightmare???? I apologise for the complete laziness… it’s 10.30pm and I can’t be bothered to crop my backpack bags out 😀 I still don’t really understand why he gets so irate… everything is organised perfectly and I can locate the stuff I need. I will profess, after taking this picture I sold a few mats and got rid of the WoD follower armour I don’t need, but still. WHEN are we going to get a Tabard storage system? It’s getting ridiculous now. So, what are YOUR bags like: organised chaos or sparse and empty? A day in the life of your toon. This is particularly difficult for us, as neither of us really do the RP thing. I do think of each of my characters as having their own little personalities though, even if they don’t really have a backstory, so I’ll imagine what their lives might look like based on that. Not really my thing, I’ll keep out of this. Over to you, Mrs B. 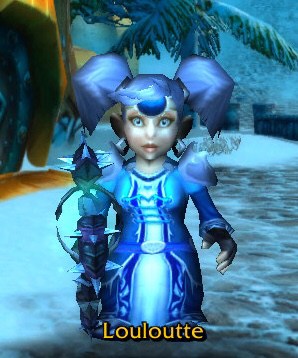 So I play a Gnome Mage called Louloutte. Here she is… it’s an old picture, but the one I most associate with her. She has silver hair, pigtails and she’s the boss of the clan… and knows it. She’s super clever and likes to be top of the class, getting the best marks in all her professions and reputations. She has lots of Best Friends, especially at Halfhill where she feels most at home, but actually much prefers to spend time with her pets farming, fishing or reading. A typical day for Loulou starts fairly early. She rises, feeds the animals on her small holding and eats something fairly filling, like porridge with fruit from the garden. She then wonders off to the market to get supplies for the day (it’s not that far away, after all!) and runs some small errands. She makes sure to visit her friends and pat the Dog, before returning home to do some fishing on the edge of the village. She really should travel to Dalaran more often to fish in Margoss’ pool, but the hustle bustle of the city isn’t really to her taste, she generally only goes there to visit the Class Hall or for trade. Just before lunch, Lou likes to pack some hearty soup and homemade bread and head off on her adventures. Some days, she likes to see if she can add to her collections of battle pets, archaeological finds or rare fish. Some days, she prefers to try and make friends with those pesky Nightfallen rebels… they are hard to please, and she doesn’t really like killing helpless Demons – she is pretty powerful these days after all, they don’t really stand a chance. If she does say so herself. After a busy afternoon, Lou usually pays a visit to one friend or another. Sometimes that giggly Druid NElf who likes to take lots of pictures and enjoys going off on crazy adventures (she never knows when she will see Alunaria, that Druid goes off swimming all over the place without warning!! ); and sometimes with a certain pink haired Gnome who likes to fly her round collecting this treasure and that treasure. She has recently even been persuaded to join a very busy Rogue who takes her off to invade Broken Isles, and who is so quick at dealing with those nasty Demons, that she is usually just finishing fighting off one when he has finished the task required. And sometimes, just sometimes, Loulou likes to go home, sit in the garden and read an excellent book with her favourite Onyxian Whelpling, Sapphira, sat next to her and get an early night. The life of this little Mage is very busy, but she is lucky to have lots of good friends to share it with. We both had trouble with the last topic (random things) so we will revisit that later. However this…? THIS we can do. 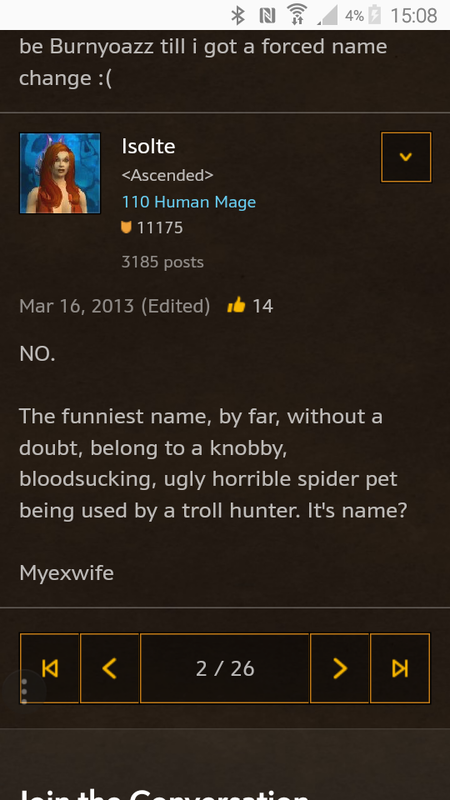 I’ve only ever mentioned in passing the naming conventions we both use, so this is a good forum to discuss it I guess. You can find our character bios in more detail here (Mrs) and here (Mr). My main is Louloutte. Most people who know us call me Lou. This is shortened from my RL name and I’m happy with that. Louloutte is actually derived from a nickname I was given by colleagues when I lived in France. Originally it was spelled correctly (Louloute), but when Mr B server changed us it wasn’t available so I got this version. I’ve come to love it, even with its spelling error. I’ve no idea why this naming convention happened, but that along with my trademark silver hair and all-female characters is how you can recognise me in game. So my first character was Kwame. He was replaced after a while with Sinnius – named after my guild, SIN. Lots of characters have kept this naming convention even after the guild disbanded – Sinnaty, Robsin etc. I then started naming characters after my surname – Burqus, Burq, Burqini etc. These days, I’ve run out of Sin names so tend to go with a variation of Burqus… All except my Demon Hunter which I named after my daughter, Felizza. I’d love to come up with a clever warcraft name though. I found this on the forum. There’s so many cool names, loads are overused though with the game being around so long. I love to find the funnies in game and have a chuckle – Pandamonium the Monk or Alarmclock [the Wakener] anyone?! I also like RP names like Fizzlecrank for a Gnome, or Grimli for a Dwarf. The problem is, I’m not sure I could give up my naming style. I think if I ever created a male character (I’m desperate to do a Draenei, but really can’t be bothered levelling it from scratch!!!!) I’d do something completely different. I’d use a fantasy name generator I think and see what it came up with. There are some beautiful ones out there. Do you guys have naming conventions? I’m behind with this as I really wanted to build an awesome mog to show off, but I haven’t had the time (read: been having too much fun in current content) to do it. So, I’ll show you a couple of favourites. These are are all available to view plus *many* more… Look on the subcategories on the right of the screen where there are many mogs from ages past (I will be updating these as we transmog after gearing). Most of these are monk mogs actually… I seem to enjoy mogging her more than my Mage, which is strange as I play the mage way more. Perhaps it suits the monk’s character?! This was built especially for The Tweeters Guild. Love those shoulders. Lou wore this for nearly the whole of MoP. I think the belt and cloak matchyness was my favourite. Monk healing set. So purdy. Go-to drood set. Haven’t changed it since she was created. I love the flowers blooming on the staff. Fairly standard leather set here, but with the awesome weapons. Another favourite. I think it’s the tabard here that I really love… with the accessories of the headband and belt. She’s already shown you loads, so here’s one of my favourites. Look at that badassery. Such a dude. All of mine are also under the subcategories on the right. Enjoy! Mr B: that’s easy. Howling Fjord. It’s just beautiful. It has mountains. Water. Snow… everything you could want or need. For me, it’s not so easy to decide. I suppose it depends what type of holiday you want? Or am I over thinking it? I’d love to go sightseeing in somewhere like Thunder Bluff or Orgrimmar. There’s so many cool things to see and do, obviously only ever playing Horde, that I haven’t done. However, how cool would it be to go sightseeing around somewhere like Booty Bay or one of the cute fising villages off the coast. Oh, how about the Panda starting island? I’d love to go back! For a beach holiday, I think I’d like to go to the nice sandy beaches of Tanaris… I’d be quite happy relaxing there for a couple of days. I love this screenshot of my rogue hanging out on the Isle of Quel’Danas. She’s spent many happy moments admiring the view of the sea. I’d also really like to visit somewhere in the mountains to do a bit of skiing or relaxing in a cosy cabin – somewhere like Mount Nevrest. I also wouldn’t mind visiting Nagrand for a safari holiday, or visiting the beautiful rocks and gems in Deepholm. 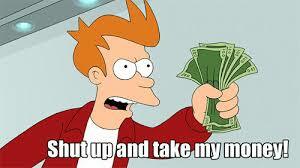 Thinking about it, I’d really love to do a tour of Pandaria. I’d visit Jade Forest, enjoy a ride down the river, take part in the sky race and visit the cloud serpents. I’d do a spot of fishing before heading to Halfhill and the market, eating lots of scummy food. Then I would go to Krasarang and have a lovely time on the beach (minus the things trying to kill me of course), then head off to the Shrine for some R&R. The problem is the same as I face IRL. There are so many amazing, varied placed to visit, I can’t really decide where I would go first. Perhaps a Round-Azeroth-Trip is a good idea?!! How has WoW changed or impacted your life? 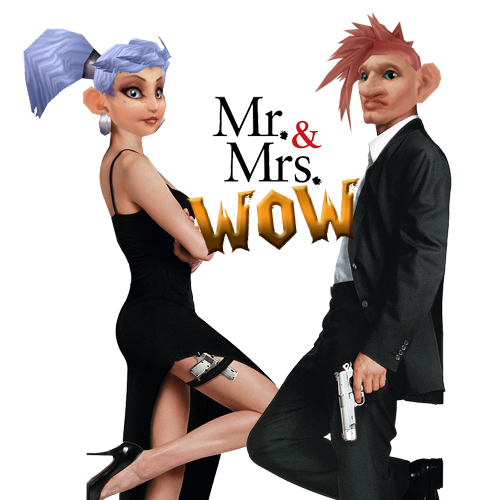 Like many others, WoW has had a huge impact on our personal lives. Mr B: for me, the impact on my life was greatest when I was younger. Pre-WoW, I was on a route to self destruction, drinking so much I didn’t realise I’d knocked my teeth out, smoking my wage away, fighting and generally being an idiot. If something hadn’t have changed, I would be in jail right now. Luckily, my brother suggested downloading this new game called World of Warcraft and after a few teething problems (I rage quit a few hours in when I couldn’t do the Void Walker quest), I found my mojo a week later and haven’t looked back since. 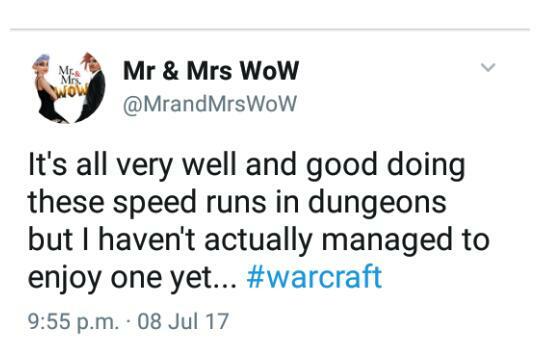 Mrs B: it took me three years to adopt the “if you can’t beat them, join them” attitude to the “stupid game” he spent all his time on 😉 I rolled a NElf mage initially (didn’t last), neither of us can remember when I rolled the Gnome, but I’ve always been a Mage. From my point of view, other than finding a great hobby, the impact has been a little less profound but just as important. 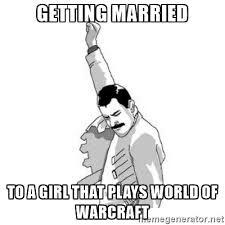 Other couples go to the pub, or the cinema, or dancing… We play WoW. Having something to enjoy together has helped our relationship no end, we always have something to talk about (that isn’t the children!!) that’s for sure. 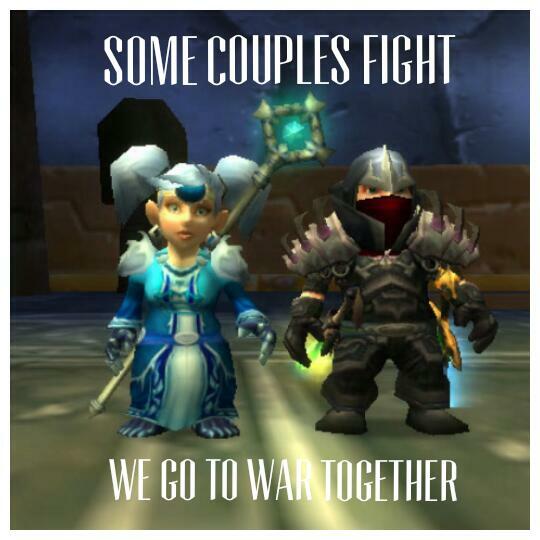 As a couple, we have made – we hope – lifelong friendships with a few of our in-game friends. It frustrates us daily that we aren’t closer geographically to them too. We have met one couple, with hope to meet others soon. Life, kids, work all inevitably get in the way, but we continue to hope. These friendships have had a great impact on both our personal and gaming lives… not sure where we would be without them!